light socket for reverse light bucket? This section is for discussion of OEM police package options and police equipment for the Caprice (both OEM and after-market), as well as after-market upfitting perfomed on our cars. So when I was replacing the battery in the car, I noticed that the light bucket for the reverse lights have a second hole. I'm assuming that's for the emergency lights. I'm thinking that might be a good spot to put a second reverse light? Maybe something stronger and LED. BUT, I need to know what kind of light socket might fit that spot. Anyone know? My apologies if this has been discussed before, but I would have no earthly idea how to search for something like that. 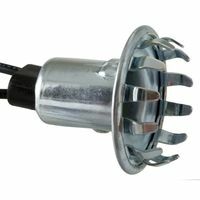 Re: light socket for reverse light bucket? The second hole was likely drilled by an installer to install a grommeted hideaway LED lamp Such as the whelen vertex. If your hole is not already to big for that. I'll have to get back there and actually measure things. I just took a glimpse when I was working on the other project. I'll have the interior panels out again when I hook up the power to the new exhaust, so I'll take some measurements then. Fingers crossed it's not hogged out too much. Luckily, the tail light lenses aren't that terribly expensive. I may go ahead and grab a pair to add to my stack of spares. I did this years ago and there wasn't much interest for some reason. Its a great mod both from the look of it and the actual light output. Takes very little to get it done. Gene you actually responded to that thread. I don't even remember that post, but thank you for digging it up! There is a hole cut in the top of that bucket already, and it looks like it was in the ones on your car, too. I guess when I pull the assembly out I'll run down to the local parts house and see if I can find anything that fits w/o drilling/filing another hole. Since you didn't see much difference in the light output, I'm wondering if things would be better with an 1156/1157 size bulb? Was there much reflective material inside the bucket, or might it be best to get something more in the 'fog light' style of things, and point it directly back? I am also planning on LED in this socket, at least, but will probably do the backup lights that way, too. I think you read some of that wrong, I had no holes in mine at all what I noticed was the empty space that had a reflector already present in it, so I made the hole then had to cut out the wings for the bulb holder. As far as the light output, I used 2 different types of LED bulbs when I did the conversion I already had used a LED for the stock back up bulb, which already was an improvement, however with the added 2nd bulb its completely different and makes a huge difference while backing up vs the single OEM type bulb.